If you're sick and tired of getting hurt and having sore muscles from lifting your ladders from the top of your van then we've got the perfect thing for you. WEATHER GUARD drop down van ladder rack gives you a convenient way to load and unload your ladders. You can choose between a single drop down, dual drop down, extended single drop down, or extended dual drop down ladder rack for your full size or euro style van. The WEATHER GUARD EZGLIDE2 drop down van ladder rack is made out of a lightweight aluminum in a brite white ARMOR-TUF® powder-coat finish. 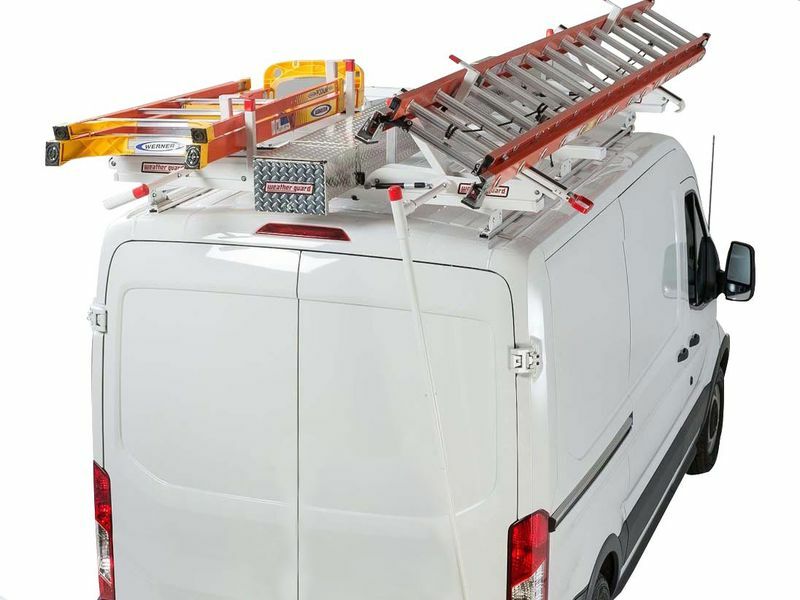 This van rack is able to fit numerous sizes of ladders from six feet to 40 feet long. Included with the ladder rack is hydraulic dampers with a smooth roller design that reduces the effort of raising and lowering your ladders. If you're worried about your ladders stay put, you don't have to. Interlocking ladder supports are included to ensure your ladders stay in place. WEATHER GUARD drop down van ladders racks are made in the United States and backed by a limited lifetime warranty. If you want an easier work life you need to get yourself this ladder rack. WEATHER GUARD offers a limited lifetime warranty on their EZGLIDE2 drop down van ladder rack. WEATHER GUARD EZGLIDE2 drop down van ladder racks include mounting hardware for easy installation. If you have any questions please call us at 877-216-5446.